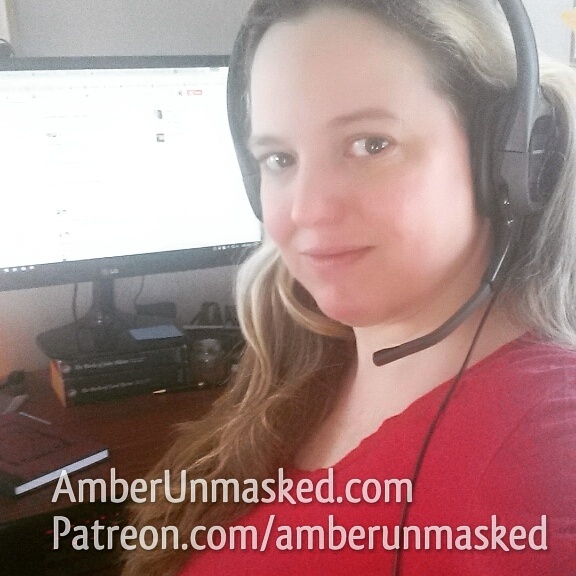 Two chapters prior, Amber Love confessed to botching some evidence gathering. 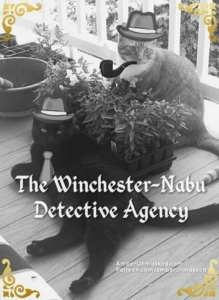 Detective Inspector Guster Nabu closed the case unsolved. THE WINCHESTER-NABU ESTATE. MORNING. INTERIOR – DINING ROOM. It was a crispy and sunny autumn morning in October when I discovered that I’m not the Worst Assistant of All Time™. I hadn’t slept well at all – up half the night. I remember Gus crying at 2AM for probably a solid hour. I fell back to sleep around 5:30 and woke up about two hours later. Gus was there waiting for me to take him out for his morning walk. I wasn’t sure what kind of condition I was in. The walks from the day before along with a miserable upper respiratory infection have left me sore and tired. I wasn’t hurting as much as when I went to bed. That was a good sign. 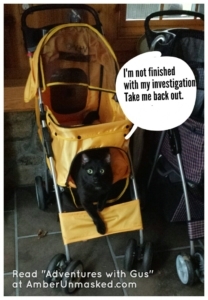 I got the spry detective into his harness and was about to walk out the door when I saw a plastic bag on the dining room table. I went over and took a closer look. 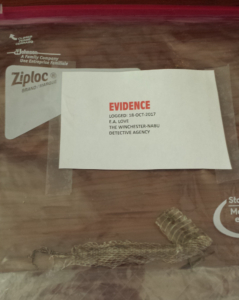 It was the evidence I thought I lost! What a relief. We enjoyed our walk and I couldn’t wait to get back inside to process the bag of snake skin. It turns out that my initial estimations of the size of it were a tad exaggerated. 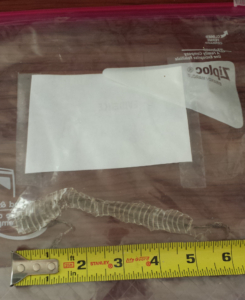 It’s not like I claimed it was an eight-foot anaconda, but it definitely wasn’t as big as I thought. I made the proper label and took more snap shots. At this point, I was trying to follow protocol, but Gus would not stop howling for attention. He occasionally ran with Oliver, but mostly, it was two hours of howling since we came inside from our walk. I gave him second breakfast which he ate in ludicrous speed. I considered it my office hours. I got my coffee ready (bleh, grounds in it) and got to work. He kept crying. I called him to come up and help me. He came upstairs all right, but he climbed up and drank from the serenity fountain. Then he couldn’t seem to figure out how to walk over to the desk which should be an easy step for him. He got down on the floor and decided to inspect a package instead. It’s new vacuum filters. Not exciting stuff. I was finally able to settle into my work once Gus calmed down. In my grandfather’s old chest of drawers, I keep some of his things including a magnifying glass. It was time to take it back out. The skin is most certainly reptilian. Close inspection shows anomalies at one end. There’s no recognizable head so we have to look at other things to determine which end is which. My train of thought was disturbed by Gus. He got out of his cardboard bed and perked up at a noise. I suddenly felt cold. Freezing cold. I had been comfortable and drinking hot coffee, but at that moment all I wanted was to be burrito-rolled in an afghan. The heat was working fine and had only been turned on the night before. I saw my exhale vaporize in the air. A bitterness like this while indoors with working heat means only one thing: paranormal activity. Why would our investigation of a possible Gorgon birth stir up spirits? This seemed most peculiar. My head felt heavier by the minute. Was it the cold medicine wiping me out or was it something supernatural trying to stop me from digging into this case? My fingers moved even slower across the keyboard which is saying something about my normal 48 words per minute. People can type with their thumbs faster than I do with a full keyboard. Needless to say, it was a sluggish pursuit of information about ghosts + Gorgons. Happily, I can report that there is precedent of sorts. In A Fig for Fortune by Anthony Copley: a Catholic Response to The Faerie Queene, there’s a section about half serpent/half human beings named Dispair and Errour. This source dives into the links back to Hesiod’s Echidna, a creature which also came up in my early searches. There’s considerable belief that Echidna was a sibling to the Gorgons sharing a mother. This Catholic Response source points out that the connections between humans, Gorgons, and half-serpent beings goes back to Cato the Younger’s battles with Caeser where he marched his army across the Libyan desert and lost many soldiers to venomous snakes. It’s a fascinating read that follows the movements of Cato even when he’s become a ghost. 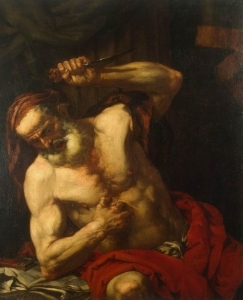 In gory detail, legendary authors have noted that Cato stabbed himself, ripped open his torso, and removed his own bowels — thus leaving him in a perpetual state of “looping” as is common with ghosts. At that pleasant thought, I wondered if the spirit world was warning me against investigating or pushing me forward telling me that I was on the right track. The chill dispersed enough that I couldn’t see my breath anymore and my skin began to warm up. We don’t have any sea gods around here because we don’t live by the sea. It’s at least an hour drive to the Atlantic border. We are, however, pretty close to rivers like the Delaware, Raritan, and Musconetcong (to be honest, the Musky is barely a creek). As I said in Chapter 26, I do have a statue in honor of the Minoan Snake Goddess which was a goddess cult figure. Gus often assists in tarot readings and rituals. He was heavily involved in the spells to support social justice protests when we couldn’t be there in person; for example, the Women’s March. This shed skin may be the proof needed to classify a new subspecies of Gorgon. 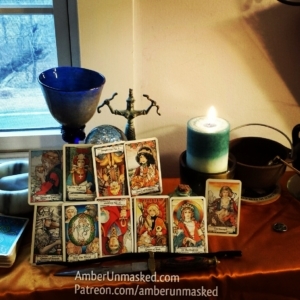 I think what happened is that we summoned enough divine feminine energy while the snake goddess was on the altar and millions of women around the world were focusing energies and prayers that new forms of magick (interfaith, intersex, global) willed new beings into creation spontaneously. It was a massive cross-cultural birth of divine babies. With this new information, Gus and I are upgrading this case and sending our findings to Professor Oliver Winchester. Without skeletal remains, it’s going to be difficult to determine the anatomy and physiology of this new serpentine deity. It could be like Echinad or it could be like the Gorgons or something never before imagined. Copley, Anthony, and Susannah Brietz Monta. A Fig for Fortune by Anthony Copley: a Catholic Response to The Faerie Queene. Manchester University Press, 2016.